Emily Dickinson’s Jasmine Tea Blend – Simpson and Vail. . . .
Now I have to start this off by saying that I am a sucker for author inspired tea blends. So it goes without saying that you are sure to find me reviewing more in the near future. Which shouldn’t be surprising since what is better than a cup of tea and a good book? Now I think that this tea was simply delightful. It is not too strong and not too subtle, it has a perfect balance in my opinion. As a matter of fact when I was drinking this tea it was like it started to clear my head. Now I don’t mean completely like a lavender tea would do, but to the point where I could think about things. Now since I go to college I began to think about things I could do for my final that is coming up but not only that I can imagine this tea being a perfect companion when I am writing for a more creative venture. I was also surprised that this tea had little to no dry notes in it whatsoever. And in my experience with jasmine, there would always be slight, somewhat powerful dryness to it. But I believe that this a soft and balanced tea because of the ingredients. The jasmine tea is a beautiful binder for the rose petals, jasmine blossoms, marigold petals and blue cornflower petals. It goes without saying if you have read any of my previous reviews, that I have always loved the pairing of jasmine and rose. In my book, jasmine and rose will always be the power couple. Now when I was in the process of brewing my cup I had a look at the tea leaves and apart from the enjoyment of finding little jasmine blossoms I was happy to see plenty of blue cornflower petals. Now, for those who don’t know, my favorite tea of all time is Lady Grey and that contains, you guessed it, blue cornflower. And I believe that the blue cornflower is a perfect addition to this tea for it adds a nice subtle, sugary sweetness to the blend. On top of the delightfully delicate tasting tea the price is not at all bad either. It is $9.75 for a 4 oz tin but if you don’t want the tin you can save about $3 and pay $6.90 for a bag of the same size. Along with a great price this tea also has deep connection with the talented poet we know as Emily Dickinson. As the description reads on the bottom of this review, this tea was based off of Ms. Dickenson’s garden, which was a place that she got most of her inspiration from for her poetry. Emily Dickinson was born on December 10th, 1830 and lived in a home that was central to Amherst political society thanks to her father and brothers. Growing up around powerful men prepared Dickinson for a life of the same, but society dictated that, as a woman, she was relegated to seemingly less meaningful ventures. Her anger at this slight comes across in her poetry and letters where she explored complex ideas of meaning and self while examining the smallest details of the world around her. She withdrew herself from society and lived in relative solitude until her death. Only a few of her poems were made public during her lifetime, but four years after her demise, a collection of poems was published and met with popular and critical acclaim. Her poems reveal a complicated mind that examined itself with as much attention to detail as it examined the world. Dickinson’s defiance of categorization and simplification make her a popular poet to study even today. In the years she spent away from society, Emily Dickinson cultivated an extensive garden. In it, she grew jasmine flowers, cornflowers, roses, and many other flowers, plants and herbs. These flowers appear repeatedly in her poetry so our blend had to be floral. We created a delightful combination of jasmine tea and rose petals that brews to a light ecru cup with long green leaves and rose petal accents. This delicate tea hits you with a strong jasmine taste that’s sweetened and mellowed with the subtle flavors of the rose petals. blue cornflower emily dickinson emily dickinson's tea Flavored Green Tea floral green tea flower tea Green Tea jasmine tea literary tea Literary Teas loose leaf tea rose tea Simpson and Vail SororiTEA sororitea sister SororiTEA Sisters Tea Tea Review3 Comments on Emily Dickinson’s Jasmine Tea Blend – Simpson and Vail. . . . Delicious nutty genmaicha blended with sweet succulent strawberry green tea. This is Azzrian’s blend. Azzrian loves genmaicha, and strawberry teas are her weakness, so she combined the two. A mix of nutty and sweet, just like her! I am so happy that I finally got around to trying Azzrian’s custom blend from UniqTeas! This Nutty & Sweet SororiTEA Green Tea from UniqTeas is so yummy! I enjoyed the first pot that I brewed of this tea that I made another pot … I’ve been drinking this all afternoon! The blend that Azzrian created combines the deliciously sweet, toasty taste of genmaicha with the juicy, sweet taste of strawberry flavored green tea. The first few sips of this tea … I didn’t notice a strong strawberry presence and I actually found myself worried that I wouldn’t get a lot of strawberry taste out of this … and was feeling a little disappointed. But after about the fifth sip, the strawberry began to emerge and by the time I was near the end of the cup, I was really thrilled with the way the strawberry notes mingled with the toasty, warm notes of the genmaicha. The mouthfeel is soft and smooth. The flavor of the green tea is light and slightly buttery, and the genmaicha gives it a deliciously nutty taste that is roasty-toasty and delicious. The strawberry is sweet and a little tart, and the flavors linger on the palate long into the aftertaste. Another really enjoyable tea experience from UniqTeas! YUM! Sweet caramel notes are accented with a touch of spice and hint of almond. This is LiberTEAS blend. Learn more about creating your own blend here. You can order this blend here. Not too long ago, we (the SororiTea Sisters) were contacted by Uniq Teas and invited to each create our own blend which we could then sample and review. Well, of course we took them up on it! It sounded like fun! And it really is fun! The Uniq Teas website is so easy to use! You just create an account, then choose from their selection of 40 different Organic and Fair Trade teas to create a blend. You choose the teas, and you choose how much of each blend is used to come up with your own unique blend. Then, you name the tea, design the label, and you write the description. You even decide if you want the tea to be a public tea (available for everyone to purchase) or a private one. It was a blast to put this blend together. It is a blend of black teas: Caramelicious, Black Chai, and Almond. I then chose the name Sweet & Sassy SororiTea because caramel and almond is sweet, and I thought that the spices would add a certain sassy attitude to the cup without coming off as being too spicy. And I’m really happy with this! 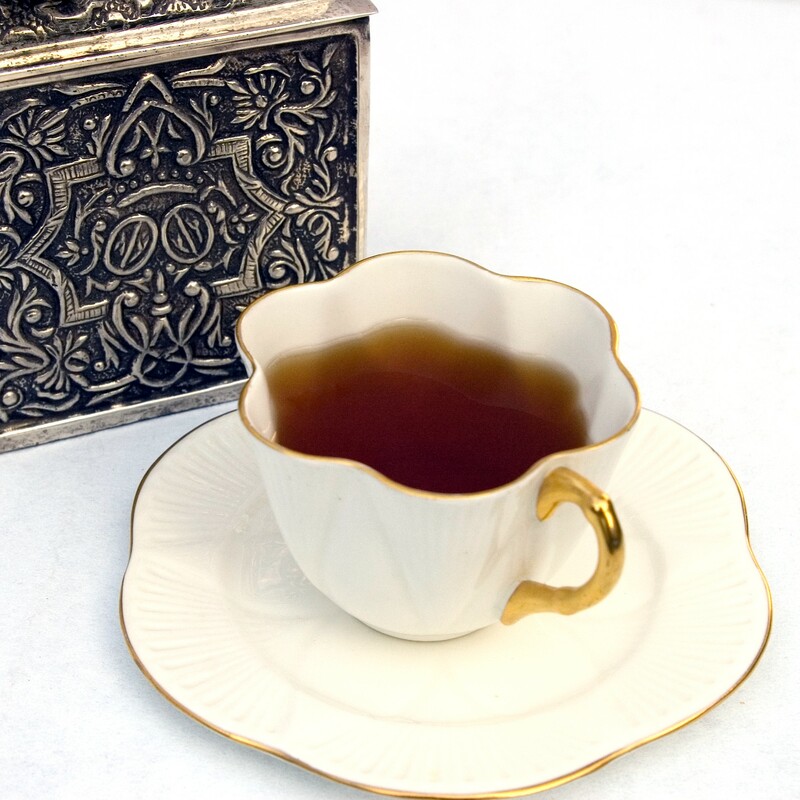 The black tea offers a strong background of flavor – it is rich, assertive and slightly astringent. I’m not experiencing any bitterness, but, I also think that this is a tea that you don’t want to over-infuse, because I think it could become bitter if it’s left to brew too long. I steeped this for 3 1/2 minutes and it came out just right. And even though the black tea base is strong, it doesn’t overwhelm the flavors which I find to have just the balance I was looking for. The caramel comes through as the strongest flavor, and there are hints of almond in the background. The spices are loud and indeed sassy, but they aren’t overly spicy. It was my intention that even though a chai blend was being used as part of my tea blend, I didn’t really want it to come off as a chai. I wanted it to come off as a spiced caramel blend with a touch of almonds, and that’s just what I got! This blend is great served straight … but I like it even better as a latte as it helps to bring out the creamy notes of the caramel and the sweetness of the almonds. I am definitely going to be returning to Uniq Teas in the future to create another blend … maybe a twist on Earl Grey next time! Welcome to the SororiTEA Sisters Blog! Greetings and Welcome to the SororiTEA Sisters Blog. Jennifer and I started this blog out of our passion for tea! We have been active reviewers for other blogs (and we hope to continue to be active for them!) however, we drink so much tea that we decided to branch out and start a blog of our own! We are just getting things started… so please excuse our dust as we continue to set things up! On this blog, you will find original reviews of teas that Jennifer and/or I have tasted and have enjoyed – or maybe didn’t enjoy. It is our mission to share with you our honest feelings about a tea. That being said, we aren’t trying to influence your decision about any particular tea. Just because we like – or don’t like – a particular tea does not mean that you will like or dislike it. One thing that I learned a long time ago (much longer than I care to admit!) is that each tea tastes different on each individual palate. So, you may be wondering: just what qualifies ME to review tea? And that is a valid question. My only answer to that is that I have been in the tea business now for over eight years, and I have been flavoring and blending my own unique tea flavors and blends for even longer. After eight years, I have decided to close my business so that I can spend more time writing about tea as well as focusing on other endeavors. Running a business is hard work! Even with all of that experience, I don’t consider myself an expert – I am continually learning new things about tea. I am extremely passionate about tea. I drink it all day, every day. I hope that you’ll enjoy visiting the SororiTEA Sisters Blog. We will update daily with new reviews of teas and tea products, so do make a point to check in often to see what we’re up to! I encourage you to feel free to comment on our reviews – we’d love to hear from you! Review SororiTEA Tea Welcome1 Comment on Welcome to the SororiTEA Sisters Blog!